Standing on the edge of the Salt Valley Anticline we looked at the depression that had been created by rising salt deep below the earth’s surface within the crust in the Paradox Formation. As it rises it pushes on the layers of rock and sediment above creating a dome like hill on the surface. Big cracks called Joints begin to form and allow water to drain down to the salt level and dissolve the salt. As it dissolves it leaves unsupported space below the other layers, and gravity helps to collapse parts of the upper layers. 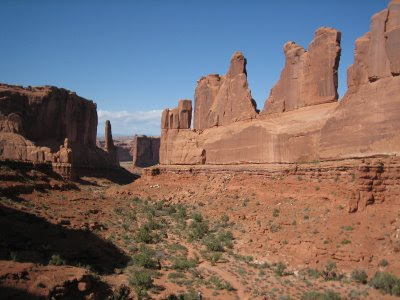 In Arches National Park, which is part of the S.V.A. We stopped at the Park Avenue Trail Head and Renee continued the story. The picture is of the Park Avenue Trail Head courtesy of Scott Frost. As the ground collapses it falls in between these joints that were created previously, leaving these gigantic walls of rock. The rock shown here is two different layers, the top, smooth rock is calld the Slick Rock Formation, and underneath it, the more ‘bricky’ looking layer is known as the Dewey Bridge.